How to Apply Eyeliner is an important step to make your eye bright and shining. Then, to enlighten your eyes, please follow our tips on applying eyeliner. Usually, there are two types of eyeliner—eyeliner pencil and liquid Eyeliner. When you choose the eyeliner pencil, remember set the line with eyeshadow to protect the penciled line from melting and stay up for a whole day. If you use liquid eyeliner, start the line from the inside of the lashes to the outward in a big sweep. If you want to line from the middle of the lash, it’s ok to line to outward firstly and then line from the inner corner of the eye to the middle to finish the line. You are encouraged to have a steady hand, because it will widen your eyes’ appearance. Want your eyes appear naturally and without the feeling of makeup? Start with a completely bare eye to do a basic eye for yourself. Full the spaces between the lashes with dotting liquid liner and wiggle the liner into the lashes. To do this will make the liner seem a part of the lashes. Also you are required to apply with a light hand. Being Sensitive to the popular trend? Want to keep up to date? Line a smoke eye yourself. The smoke eye has been popular for a long time. First, apply eyeliner from the inside corner to outward. Second, put strokes into the lash line. Make sure the middle of the line thicker than the edges. Then, smudge the liner by a cotton swap. 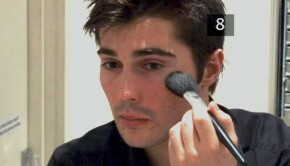 Lastly, use your eyeshadow brush dabbing eyeshadow and apply over the eyeliner. Remember to blend your shadow well. Layer liner with a shadow makes a wonderful smoke eye.